In Campo Bello each player tries to remove as many of their own pieces from the board as possible. When it is your turn, you must choose one of your movers and jump another mover with it. If the piece you jumped over was one of yours, remove the jumped piece from the game. If the piece you jumped was one of your opponent's, then you may remove any one of your movers on the board (including the one that did the jumping if you choose). The player with the fewest points wins! You MUST make a move if there is one available! Campo Bello has the ability to bend the rules! Using legal Campo Bello moves, try to remove as many of the yellow pieces as possible. Use the entire board. · The blue piece cannot move..
· Each of your pieces can jump the blue piece only once. Scoring - leave 3 or more... meh; leave 2...good; leave 1...excellent! If playing with one color each is too predictable, try this. Set up the board with all 4 colors. Select two colors and play both colors against an opponent's two colors. · The game will play slightly differently if you pick two adjacent colors rather than opposite colors. With adjacent colors you will take two turns in a row, then your opponent will do the same. With opposite colors, turns will alternate. Try each and see which way you like better! For a slightly longer game, with some randomness added, add a single die to the game. Roll the die after your turn. · If you roll a 1 or 3, add one of your movers back on the board, on any open spot in your home area. 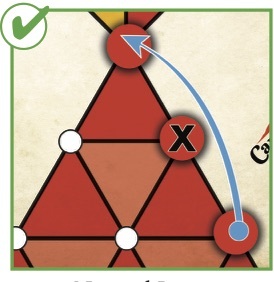 · If you roll a 2 or 4, remove one of your movers from the board. · If you roll a 5, select an opponent. That opponent must put back one of their movers in their home area. · If you roll a 6, remove 2 of your movers from the board. What are the Inspirations for Campo Bello? We were inspired by the classic peg solitaire game that has been around for more than 100 years. The jump-type moves and the removal of pieces came from that game. Also games like Chinese checkers and regular checkers provided bits of inspiration. Finally, the generous feedback of all the people who have played the game since the board was a piece of graph paper. Have a thought? We'd love to hear from you! Make a comment, offer a suggestion, add an extension. Let us know your thoughts about Campo Bello...any opinion is welcome! Also, feel free to post to our CAMPO BELLO BLOG with any thoughts or ideas you'd like to share with not only us, but the community as well!